Details The roots of the plant Rubia tinctorum supply the coloring substances that are converted to madder lakes, the principle coloring substance which is alizarin. The shades of colors of madder lakes vary from scarlet (stannous madder lakes), carmine red (carmine-containing madder lakes called madder carmine), pink madder (madder lakes with a high content of pseudopurpurin and/or purpurin called pink madder or rose madder), to red with a bluish tint (alizarin lakes). Madder has been cultivated as a dyestuff since antiquity in central Asia and Egypt, where it was grown as early as 1500 B.C. Cloth dyed with madder root pigment was found in the tomb of the Pharaoh Tutankhamun and in the ruins of Pompeii and ancient Corinth. In the middle ages, Charlemagne encouraged madder cultivation. It grew well in the sandy soils of the Netherlands and became an important part of the local economy. Thompson thinks that the madder lakes were less employed in medieval painting then were the brazil lakes. He says that pure madders, as they are known now, came into use in the 17th and 18th centuries and that they were not important in the Middle Ages [The Materials of Medieval Painting, pp. 123-124]. By 1804, the English dye-maker, George Field, had developed a technique to lake madder by treating it with alum. This turned the water-soluble madder extract into a solid, insoluble pigment. 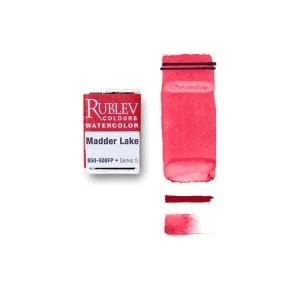 This resulting madder lake had a longer-lasting color, and could be used more versatilely, for example by blending it into a paint. Over the following years, it was found that other metal salts, including those containing iron, tin, and chromium, could be use in place of alum to give madder-based pigments of various other colors. As an extract of the root of the madder plant, which was allowed to grow for two years in the ground, the root is not red itself, but contains alizarin, which can be made to produce red lakes of several shades and precipitated on a clay base. Pigments and dyes are not identical, although there are cases in which the same coloring matter which yields a dye or stain may give rise to a pigment. A pigment is, in fact, a substance which is insoluble in the vehicle with which it is mixed to make a paint, while a dye is soluble. A lake pigment is a natural organic pigment prepared when a dye has been precipitated on a powdered, colorless, inorganic substrate. The term derives from the Latin word lacca, used in the Middle Ages to denote both lake pigments and the Lac dye. Because of its transparency, aluminum hydroxide is the most commonly used substrate or carrier. Barites, such as barium sulfate, provide an opaque lake pigment. Other compounds used as carriers are: chalk, clay, gypsum, tin oxide, zinc oxide, white earth, and green earth. Often a mordant, such as tannic acid, lactic acid, or sodium phosphate, is used to fix the dye to the substrate. 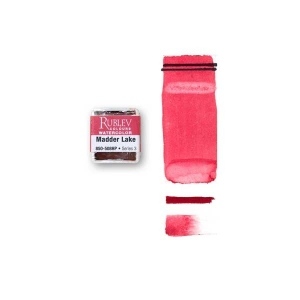 Madder lake and rose madder for artists' pigments are prepared from madder extract by adding alum and precipitating with an alkali. It is a beautiful transparent red, but impermanent. In the trade it is available as rose, light, medium to dark, and violet. Rose madder is known to fade within a few months of exposure to strong light, but the darker tones are more permanent. In fresco, lime destroys madder completely. In the original root there is a second coloring agent called purpurin, which when removed creates a superior permanence. Madder lake requires about 70% binder, dries poorly and should therefore be first mixed with linseed oil and ground with an addition of damar. It has been observed over time that madder lake bleeds, and when so it has been an indication that it has not been used properly, perhaps too thickly in underpainting, or that it has been mixed with impermanent coal-tar dyes. 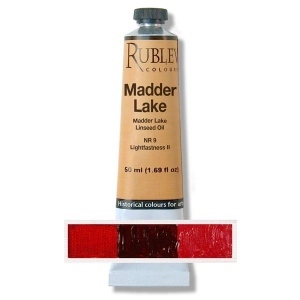 Madder lakes, especially those that contain little or no purpurin have been well preserved in numerous European easel paintings, especially where it was employed as a glaze with another similar hue. 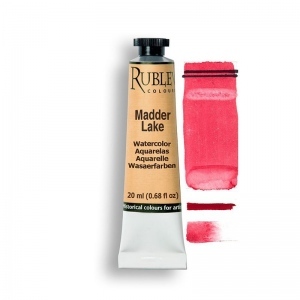 Glazed over vermilion madder lake produces an intense cherry red unachievable by direct mixture of paints. Vermeer used this glaze in the plumed hat of his painting The Girl with a Red Hat and in the satin gown in The Girl with a Glass of Wine, both very well preserved. No data has been published on the oil absorption and grinding qualities of lake pigments made from madder root. The essential coloring matter of the madder root is considered to be non-toxic.